In this chapter David describes the anxiety and despondency he feels due to the incessant pressures exerted upon him by his foes. Their hatred and hostility allow him not a moment's rest, as he is compelled to constantly devise tactics to escape their schemes. Acknowledging that whatever strategies he devises will succeed only with the help and direction of the Almighty, David prays that God should "illuminate my eyes," provide him with the proper wisdom and direction in dealing with the threats he must confront. In a characteristic expression of self-effacing humility, David declares in this Psalm's final verse, "I trust in Your kindness; my heart shall exult in Your salvation." According to Ibn Ezra, David here confesses that he is undeserving of God's assistance, and must therefore rely solely on "Your kindness," the Almighty's compassion and graciousness. He asks that God save him not on his own merits, but rather as an undeserved act of kindness. 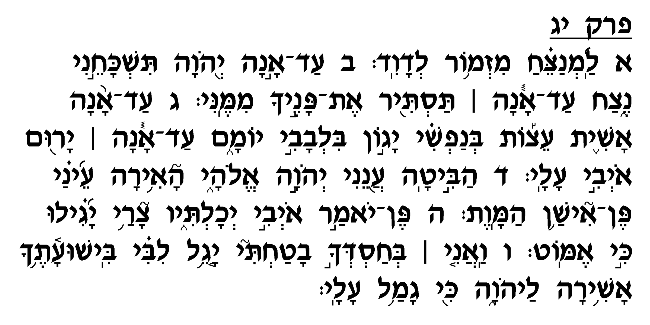 Rashi (verse 2) claims that despite the singular, first-person form employed throughout this chapter, David does not speak here of his own tribulations and need for salvation. 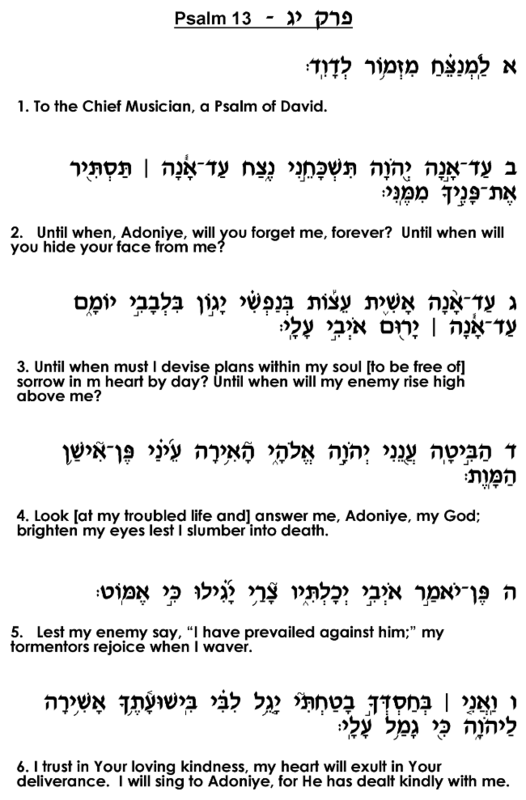 Rather, he composed this Psalm as a prayer for the Jewish people generally, who endure seemingly incessant hardships over the course of exile. Indeed, throughout Jewish history our nation has rarely enjoyed periods of restful tranquility. 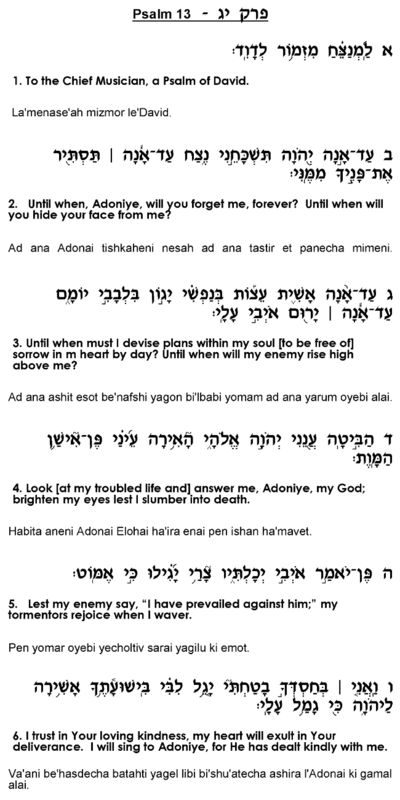 In virtually every generation of exile, we have been forced to devise strategies to ensure our physical and spiritual survival, and we have looked – and continue to look – to the Almighty and beg, "illuminate my eyes" (verse 4), that He grant us the wisdom and foresight we need to overcome the hurdles we face living among hostile nations. We look forward to the time when we can fulfill David's promise in the closing verse of this chapter, "I shall sing to God, for He has dealt kindly with me!"